Scientific problem solving environments (PSEs) are software platforms that allow a community of scientific users the ability to easily solve computational problems within a specific domain. They are designed to hide the details of general purpose programming by allowing the problem to be expressed, as much as possible, in the scientific language of the discipline. In many areas of science, the nature of computational problems has evolved from simple desktop calculations to complex, multidisciplinary activities that require the monitoring and analysis of remote data streams, database and web search and large ensembles of supercomputer-hosted simulations. In this paper we will look at the class of PSE that have evolved for these “Grid based” systems and we will consider the associated programming models they support. It will be argued that a hybrid of three standard models provides the right programming support to handle the majority of the applications of these PSEs. Please use the following format when citing this chapter: Gannon, D., Christie. 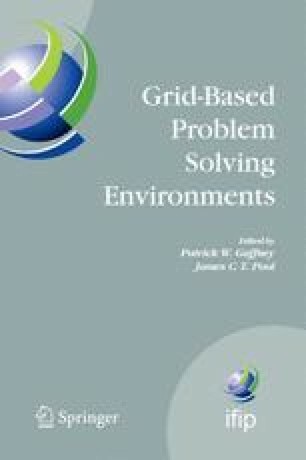 M.. Marru, S., Shirasuna, S., Slominski, A., 2007, in IFIP International Federation Tor Information Processing, Volume 239, Grid-Based Problem Solving Environments, eds. Gaffney, P. W., Pool, J.C.T., (Boston: Springer), pp. 3–15.